These are the guidelines to root Asus Padfone Infinity device using the Framaroot method. 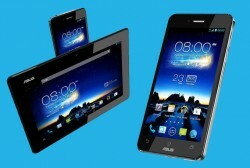 The following guide is intended for the Asus Padfone Infinity. The same rooting tool does work for some other devices in the Asus range, but it’s best to look-up a unique guide so you don’t attempt to root using an incompatible device. Note that you are voiding the warranty on your Asus Padfone Infinity device by following these steps. You can easily unroot the device using the same Framaroot application that’s on your device. Once that is done, you can send it away for free repairs under tyrant again. Most of you should find the warranty period is well land truly over for this device anyway, so no problems there. regardless of your warranty agreements, you can always find people out there who can help fix your device so long as it’s not hard-bricked. The difference is they won’t do it for free. Download the Framaroot app from the XDA Developers forum on this link . Download the Framaroot APK directly to your computer and then transfer it over to the desktop. You need to have the Unknown Sources option enabled on your device by heading over to the Menu > Settings > Security > Unknown Sources. Connect your Asus Padfone Infinity device to the computer using the USB cable. Copy the Framaroot APK over to the root of the SD card internal storage. Unplug the Padfone from the computer. Launch any File Manager you have on the device and install the APK just like you would any other APK file. Once done, tap and open the Framaroot icon that is now an app in your app drawer. Select the Gandalf option from the main menu in the app. That same Gandalf exploit will now take over your internal system and grant the rooting permissions you need to start installing your apps. Once it is complete, exit the app and reboot the Padfone manually as you normally would reboot your device. Admirable; now you know how to root Asus Padfone Infinity devices with just a single tap of the button. We call this a one-click rooting tool for Android. there are a few unique one-click rooting tools, but not all of them give you the option to unroot your devices too like the Framaroot one-click rooting method can do for your device.